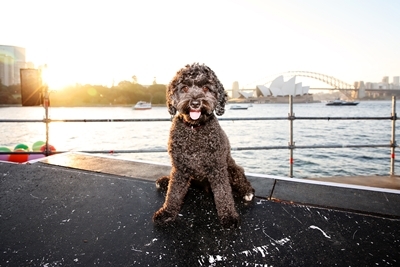 Opera Australia is putting the call out for Sydney’s most pampered pooches to make their operatic debut in La Bohème – Handa Opera on Sydney Harbour, which opens this Friday night. Director Andy Morton has decided his production will not be complete without the appearance of a real pooch at the beginning of every performance, to truly set the scene. Proud pooch owners can register their pet for one of the 26 shows from 23 March to 22 April and get themselves two complimentary tickets to the show. This is a great opportunity for a favoured furry friend to make their operatic debut, prancing across the Parisian themed set, doing their best pampered pooch impersonation. With the set themed as a wintery 1960’s Parisian streetscape, featuring beautiful cobblestone laneways, glowing streetlamps and flurries of snow, it’s anticipated the brief pooch appearance will be a highlight. No previous acting (or singing) experience is required and all small to medium-size dogs will be considered, but as La Bohème is set in Paris, poodles, poodle-crosses and French bulldogs are preferred. The dogs must be well trained, if they stay on site for the whole show, there will be fireworks, thousands of people and lots of distractions. Each dog must be accompanied by two minders to the performance, who will look after it before and after its appearance on stage. Handa Opera on Sydney Harbour is supported by the NSW Government via its tourism and major events agency Destination NSW.